Engr. Greg Ero is a Director of ARCO Group Plc. He was educated at the University of Ibadan; Imperial College, London and Oxford University, obtaining degrees in Chemistry, Engineering and Management Science. In addition, he had academic stints at Columbia University Graduate School of Business, New York and at the Institute of Management Development (IMD) in Lausanne, Switzerland. Engr. 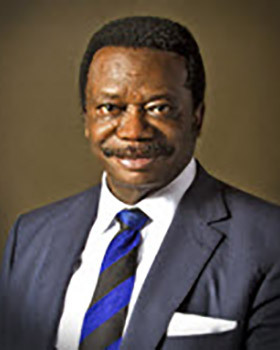 Ero served the Federal Government in many capacities for over 30 years in the petroleum industry and held many important positions between 1974 and 1999 including CEO/Group General manager of NAPIMS, an arm of Nigerian National Petroleum Corporation (NNPC); Managing Director of National Engineering & Technical Company (NETCO) – JV between NNPC/Bechtel of USA: Managing Director of Integrated Data Services Ltd (IDSL), a subsidiary of NNPC; General Manager, Commercial, Nigeria LNG; Head of Central Purchasing and supply Dept. of NNPC and Head, Federal Ministry of Petroleum Resources, Warri. He also held many Board appointments in Federal Government parastatals. Engr. Ero is a Fellow of many professional bodies and has presented many papers in both national and international seminars. He has received several national and international awards in recognition of his distinguished service to the nation, the oil and gas industry as well as the larger society. Engr. Ero is currently the Chairman/Chief Executive Officer of Arkleen Oil & Gas Limited and a Director of several national and international companies.